A few days ago, the CEO of Epic Games, maker of the “most successful video game engine”, said that AR glasses will eventually replace smartphones. Now, he could be right (if ever society gets over “glasshole”), but we were reminded of claims that tablets would replace PCs. Whatever happened to tablets, anyway? First off, what is a tablet? There are no clear-cut definitions, but in our minds they are a continuation of PDAs. The communication capabilities of a PDA were focused on the Internet – email, web sites, corporate intranets, etc. - instead of calling and texting like a phone. The Apple Newton is an early example of a PDA (it’s like a Neanderthal iPad), but the first PDA is the Psion Organiser – a weird device that looked more like a calculator than a tablet. By the way, Psion would later make Symbian. Nokia dabbled in “Internet tablets” like the 770 and later N800, but those remained niche devices. Really, there’s not much going on on the market until 2010 when the original iPad hit the stage. To be fair, 2010 also saw Android tablets from Samsung, Huawei, ZTE and Toshiba, plus BlackBerry’s PlayBook. From just 10 devices, the number of tablet models on the market shot up the following year and went on to peak soon after that. 2013 saw as many as 131 models and we’re not even counting most of the Windows field, which mostly had what we’re going to call “keyboardless laptops”. Microsoft tried its best, even ruined the Start menu, but its touch interface never took off. Not a huge deal, tablets came crashing down soon after. 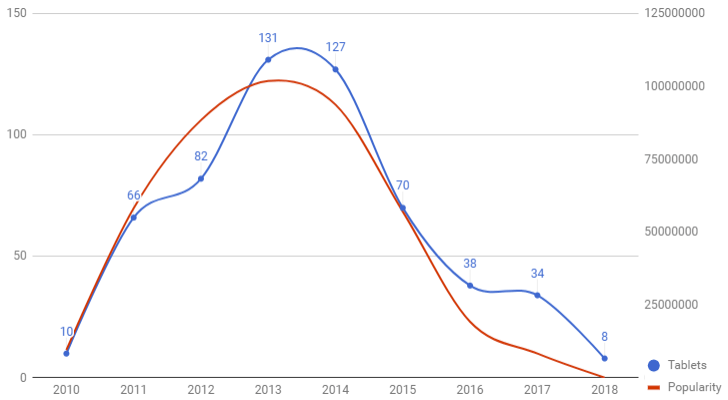 You can see it in the chart below – in blue, we have the number of tablet models, in red, we have the popularity of tablets (as measured by how many times someone checked out a tablet in our database). You can see the red line of popularity shoot up ahead of models produced – consumers’ excitement outweighed the manufacturers’ involvement. But people seemingly decided that tablets aren’t that great and interest quickly waned. If you want to measure tablet popularity by millions of units shipped, IDC has the numbers. In 2017, there was a 6.5% drop in sales compared to 2016. 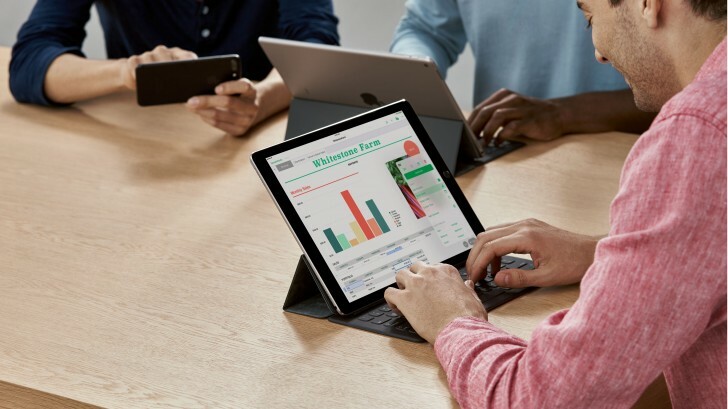 One IDC report from November 2017 states that tablet shipments declined for 12th straight quarter. Classic slate tablets are mostly stagnating while detachable 2-in-1s are seeing some popularity. But we’re back to “keyboardless laptops”. Not to mention that the average selling price has significantly declined too. On a per-maker basis, Apple seems to rule the market (26.8%), followed (at a distance) by Samsung (15.2%) and then Amazon (10.2%). For next week, we plan to do a similar article for smartwatches – why do we get the feeling that article will end more or less the same? Counterclockwise: which flagships are MWC regulars and who is just visiting? why you reply again if u know it is boring? Why I reply to you? Because you're boring and reply me at first. But why can't we talk about the idea tablets actual people seeking, it is better than blah like spamming.